Due to their portable nature laptops usually receive rough treatment but are one of the most fragile pieces of tech you’ll ever buy. 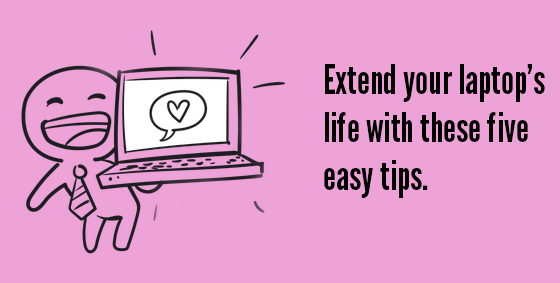 Here are five easy tips to help extend the life of your laptop. While some new laptops have an SSD (with no moving parts) for storing data, many laptops still have a mechanical drive. The drive has a head and a constantly spinning data storage disk. The head hovers microns over the surface of the spinning disk and one knock can cause them to collide. Just like a deep scratch on a DVD the data on that section will be corrupted and lost or even worse all the data on your drive can become unreadable. We also see a lot of people putting their computer into sleep mode or not even powering them off before moving the device. Always make sure you power down or put into hibernate the laptop before moving it or packing it away. Your laptop has a few ways of telling you when it’s too hot – the fan, auto-shut off and the heat of the case. Many component in your laptop are generating heat and the harder it’s working, the more heat it generates. The fan runs to blow that heat out the vents and keep the components cool enough to continue operating. Because there is no clear temperature indicator, your fan volume is the best guide to monitoring laptop heat. While the laptop is working hard (and getting hot), the fan will spin faster and louder – it is not uncommon for it to sound like a hair dryer. Help it out by keeping your fan vent clear of books, blankets, and other blockages. A regular internal clean out (performed by a professional) is also a must to help keep the laptop innards clear of dust. Inside those power cords are a bunch of delicate wires begging you to be gentle with them. You would think they should be able to take a beating, get bent, twisted and run over with chair wheels, but unfortunately they are not. Keep cords clear of sharp or flat-edged items and when wrapping for transport try to remember how it came out of the box. When moving the laptop wrap the cord gently around itself or the power adapter and secure with Velcro or similar. A laptop will endure many bumps and bangs as the bag is moved around, even with careful use. So look for a bag that not only fits your laptop but is also well padded. Ideally your bag will have front, back, bottom, top and side padding as well as a waterproof outer. If backpacks aren’t your style, look for padded or hard-shelled sleeves. Laptops provide fantastic mobility but are quite fragile. While a regular backup won’t make your laptop components last longer, it will make any issue you encounter easier to deal with as you won’t loose all your precious data. Consider a cloud based or off-site backup for additional protection, so no matter what happens with your laptop you still have all your important files. Call us at 08 8326 4364 to give your laptop a life-extending service.